The human body is made to walk, and walking keeps you fit. The human body works better when we walk. The body resists diseases better when we walk, and the body heals faster when we walk. Walking helps us to keep fit and healthy. We don’t have to walk a lot. In one study, people who walked and took medication scored twice as well in 30 days as the people who only took the medication. Another study showed that depressed people who walked regularly had a significantly higher level of not being depressed in a year compared to depressed people who did not walk. 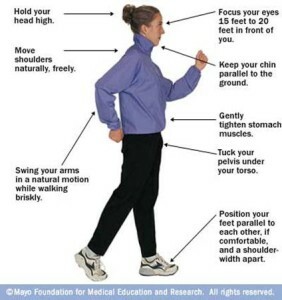 The body generates endorphins when we walk. Endorphins help us feel good. Walking half an hour a day has health benefits that exceed the benefits of losing 20 pounds.